Aaron Childs, Owner of Hi Light Services LLC, joined the sign industry straight out of high school. Early in his career, he did most of his work using Sponco and Skyhoist sign trucks. 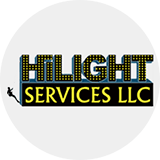 Two and a half years ago, he founded Hi Light Services LLC, doing primarily repelling and sign/lighting subcontract work. In early 2017 Hi Light rented an Elliott M43 HiReach from an Elliott distributor with 4,000 miles on it to fulfill an immediate need to service a large fast food chain signage contract. After 9 months of rentals, they added an additional 11,000 miles on the truck, and expect to keep using it in the foreseeable future. 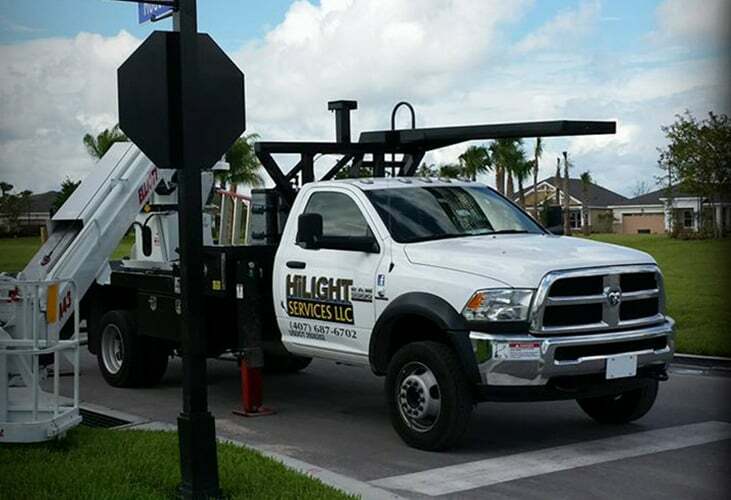 In 2017, Hi Light Services landed a big fast food contract in Florida, where they became responsible for setting 32’ pole signs. With the M43, they are able to dig the footer, set the pole with the M43 main winch, pour the concrete, lift the sign on top, and install the sign all with one machine. For service and lighting work, Hi Light typically sends out one person in the platform, and for 10’ long sign faces, they put two people in the platform. On bigger projects, Hi Light uses the M43 as well as rented or outsourced Elliott L60 or G85 HiReach models to lift big poles. 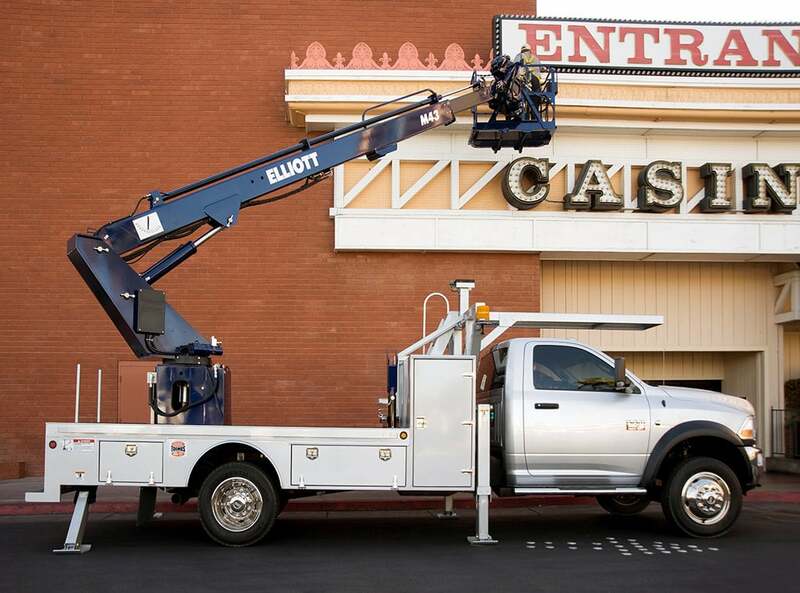 The M43 can get under the sign to weld and do assembly work while the larger truck suspends the load, helping to eliminate the need to use an extension ladder, allowing for quicker job completion. Hi Light uses various accessories offered with the M43. 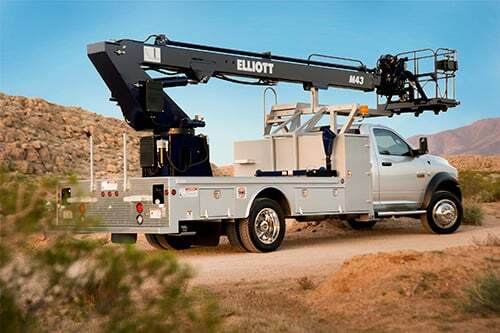 They use the 2,000 lb winch, work platform welding leads, and 110V connection primarily for aerial installation and service work. Childs tells us that “the machine’s extendable sign forks are great for holding sign faces, and you can pop them out and slide the sign face right on there for up to 10’ faces” and asserts that with the jib winch, he can set big sign faces by himself. To learn more about the Elliott M43, visit the model page with technical specs and a downloadable brochure. To speak with a distributor about pricing and availability, request a quote today.